The Speedwagon was the collaboration between Artist/Designer Thom Tayor and craftsman/builder Dan Fink. It is a unique street rod, designed to showcase the wide variety of parts available from Ford's Special Vehicle Operations Catalogue Division. It started as a sktetch on a piece of paper that then blossomed into a full size machine. 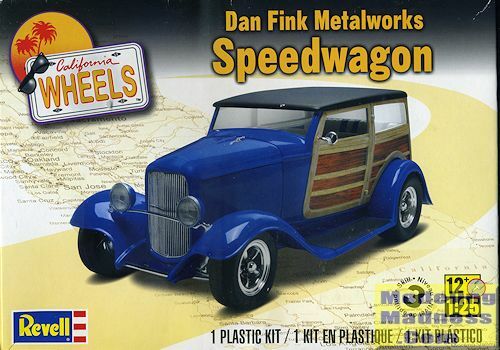 While some parts were off the shelf, much of the Speedwagon's were custom made by the team at D.F. Metalworks. The construction of the SPeedwagon started with a set of reproduciton frame rails, an orignial 3-window cowl section, steel fender and reproduction rubber running boards. The balance of the car was basically scratch built by Dan Fink's experienced crew. But, like the most modern street rods, the Speedwagon has all the creature comforts such as power brakes, air conditioning, hidden wipers and tilt steering wheel. Revell makes most of its profit from car kits so it behooves them to put their best efforts into them. This one shows that dedication by having sufficient detail to please most yet not so many parts as to make for a fiddly and difficult kit. Aside from the chrome and clear sprues, all are in white plastic. A single piece body is supplied along with a one-piece chassis that includes a lower pan and the fuel tank. A seventeen piece engine/transmission is provided and both the front and rear suspension sections are separate as well. Steering arms and drag links are included to complete the chassis. This all rolls on rubber tires with two-piece wheels that are chrome on the outside. Disc brakes are also included. The interior has a floor pan that includes the back seat. There are two piece front seats along with separate pedals. Interior side walls help hold this all together and provide an area on which the instrument panel is attached. This car has a column shift. It all fits into a one-piece body that has separate windows. On each side of the chassis are one piece fender/running board sections. The radiator is seven pieces that has a front chrome grille and radiator cap along with the coolant hoses. The hood is three pieces with an upper and two side sections. It is designed to simply set in place so it can be easily removed to show engine detail. The kit is finished with the usual external bits such as lights, plates and rear view mirror. As nicely done as the chrome is, those who want to eliminate molding seams will have to deal with stripping and repainting these items. Instructions are well done using generic color information. 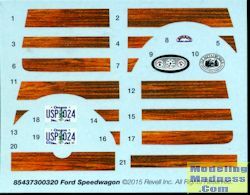 The decal sheet is nicely printed and includes the instrument cluster, license plates and the wood inserts for the body. This area will require a bit of masking to get the lighter wood trim painted. While the recommended color for the body is blue, one can really paint it any shade that is desired. If you like street rods, this is one that you should consider. It is nicely molded, well engineered and provides the opportunity for customizing. The end result will be an interesting street rod.